Breaking News: Potentiate Your DNA Goes Mainstream! Download sample chapters or order your copy today at www.PotentiateYourDNA.com. The latest book on the “revolutionary healing science” (Nexus) of the Regenetics Method, Potentiate Your DNA, is now available through mainstream distributors such as Amazon and Barnes & Noble! If you would like to purchase this self-empowering “Practical Guide to Healing & Transformation with the Regenetics Method” through such an outlet, or wish to provide some positive feedback in the form of a review, here are some quick-reference links to the book, which is also available through the Phoenix Center for Regenetics. You should be able to “look inside” the book on most of these websites. 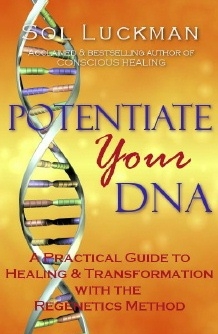 You can also download sample chapters of Potentiate Your DNA at http://www.potentiateyourdna.com/books/potentiate-your-dna. Also, for those embracing the new digital revolution, the bestselling Book One on the Regenetics Method, Conscious Healing, now can be downloaded through iTunes on the iBookstore! Depending on one’s perspective, DNA can appear to be several things. According to the “Era I” (to use Dr. Larry Dossey’s terminology) version of the biosciences, genetics, DNA is the primary aspect of biological organisms that somehow drives the origin and evolution of species independently of other factors (Figure 1). This viewpoint is contradicted by the “Era II” bioscience of epigenetics, which sees DNA as merely the gonad of the cell. According to epigenetics, DNA is actually less important than cellular proteins. The latter are considered responsible for regulating DNA’s expression and evolution through interaction with environmental stimuli (Figure 1). In formulating their theories of how species evolve and replicate themselves, both geneticists and epigeneticists address only a small fraction of the DNA molecule: the so-called coding DNA that can be observed communicating with RNA to build proteins and, in the end, organisms. Such an erroneous perception of noncoding DNA is not called out by epigenetics for the simple reason that the latter is less concerned with DNA than with the activity of regulatory proteins in the cell’s membrane. “Junk” DNA, which I propose renaming potential DNA, is dismissed in both genetics and epigenetics because neither of these sciences can explain what it is or what it does. In response to the mystery of potential DNA, genetics has relegated this vital part of the genome to the status of garbage, while epigenetics has ignored it altogether. Only the “Era III” bioscience of meta-genetics has examined the nature of potential DNA without rearguard theoretical agendas and with a completely open mind as to the Primacy of Consciousness relative to biology. By establishing the Primacy of Consciousness, meta-genetics provides an overarching conceptual framework under which the apparent duality between nature and nurture can be resolved. Specifically, meta-genetics proposes that both nature and the reality conditions that allow for nurture emerge from—and are controlled by—conscious energy that constructs and directs our biological experience intelligently. In so doing, meta-genetic theory calls attention to the blind spots of Era I and Era II, particularly with regard to the purpose and function of potential DNA. According to meta-genetics, potential DNA is anything but “junk.” Indeed, potential DNA plays the truly primary role of interfacing “ener-genetically” with our bioenergy blueprint in the consciousness field (Figures 1 and 2). In this way, potential DNA regulates cellular expression—and even the origin and evolution of species—in a manner that genetics cannot begin to account for and epigenetics cannot come close to matching. We could continue indefinitely to refine our understanding of the many elements that distinguish the three approaches to biology that correspond to the three Eras of medicine first outlined by physician and author Larry Dossey. But to cut to the chase, one subject in particular sets apart genetics, epigenetics and meta-genetics like no other: evolution. In true Era I fashion, genetics sees evolution from a Darwinian perspective, in which “random mutation” in DNA is responsible for the origin and evolution of species. The problems with this Era I model, which is seen by an increasing number of today’s scientists as obsolete, are numerous. Here, I will share the three problems that are most relevant to our discussion of DNA activation. For starters, the Darwinian interpretation of evolution is entirely deterministic—giving rise to the genetic fatalism and victim mentality that characterize the propaganda put out by the medical-pharmaceutical establishment to this day. The Era II science of epigenetics, however, clearly establishes that we have an appreciable level of ability to manage our own genetic expression. Secondly, what genetics refers to as evolution should be called, in reality, environmental adaptation. On the one hand, it is a fact that species regularly adapt to environmental situations by developing new attributes. In an oft-cited experiment demonstrating this phenomenon under laboratory conditions, lactose-intolerant bacteria were placed in a culture where their only food source was lactose. What do you imagine these bacteria learned to do very quickly? Exactly. They adapted genetically, as a colony, in order to be able to feed on lactose. On the other hand, the attempt to explain the evolution of species into entirely different species using the genetic model has failed monumentally. Far surpassing the reach of step-by-step “evolution,” which is just environmental adaptation, the fossil record reveals that species actually evolve in fits and starts—leapfrogging what would seem from a Darwinian viewpoint to be critical developmental phases. At the top of a long list of species whose evolution has mystified geneticists is the human species. Although for more than a century a “missing link” has been assumed to exist based on fiercely upheld Darwinian concepts, many are convinced that not even the recent sensationalized discovery of a new type of hominid meets all the criteria for a direct human ancestor. I share the view that Lee Berger’s finding of a two-million-year-old hominid skeleton in the Sterkfontein region of South Africa is a false lead. Moreover, I offer that scientists never will uncover an indisputable missing link because evolution of species occurs not incrementally, but more or less spontaneously. Recently, irrefutable evidence of spontaneous evolution was highlighted in the paradigm-shaking research of paleontologists David Raup, John Sepkoski, and Robert Rohde. Their exhaustive studies of marine fossils revealed cyclical episodes of “punctuated equilibrium” unequivocally showing new creatures spontaneously appearing in the layers of the ocean’s crust in regular cycles. The third problem with the evolutionary model espoused by mainstream genetics that I will mention here is like the proverbial forest that, at first, you cannot see for the trees. But if you simply step back and examine what genetics has to say about evolution from a distance, it soon becomes obvious that natural selection and survival of the fittest describe not genetic, but epigenetic modes of environmental adaptation! DNA is supposed to be primary, which basically means “sovereign,” according to mainstream genetic theory. There is no biological mechanism in the science of genetics that explains how a specific environment can foster a helpful adaptation in DNA, which then can be passed on to future generations. Such a genetic “mutation” in a given species, however, is explained eloquently and redundantly by the Era II science of epigenetics. In this model, so-called evolution occurs by way of environmental responses of regulatory proteins in cell membranes. These proteins, which react to localized environmental signals, direct the activity of genes—both electromagnetically and by utilizing RNA to communicate with DNA. The problem with this model is that while epigenetics offers insight into relatively limited adaptive responses, like genetics it sheds no real light on the mechanism behind the origin and evolution of species. In other words, epigenetics spells out how lactose-intolerant bacteria can adapt to a lactose-based environment. But epigenetics cannot explain, any better than genetics can, how a completely new species can evolve—more or less spontaneously—from a preexisting one. Only the Era III science of meta-genetics can explain the origin and (spontaneous) evolution of species. As will be discussed momentarily, the related phenomena of the creation and development of species are driven by consciousness interfacing with potential DNA through a process that can be called DNA activation (Figure 2). In order to understand this process, first we must touch once more on genetics, epigenetics, and meta-genetics. Specifically, we need to grasp their relationship to the Flow of Genetic Information. According to the official theory of genetics, DNA passes on genetic information to RNA, the enzyme responsible for building proteins. In this dogma, where nature is considered primary, supposedly there is no information that runs from the bottom up—as in, from RNA or proteins to DNA. In the 1960s, however, Howard Temin conducted experiments clearly indicating that information held in RNA can, and does, travel against the downward flow of genetic information so central to established theory (Figure 1). Figure 1: Flow of Genetic Information. The above chart summarizes the distinct ways in which genetics, epigenetics and meta-genetics explain the flow of information in biological organisms. These last two quotes provide clues as to what lies beyond the reach of epigenetics and nurture. The latter function with “tight restrictions” on the way our own localized consciousness, in response to environmental signals, can flow in reverse and rescript our “basic blueprint” (Figure 1). Epigenetics is incapable of explaining evolution because it provides no mechanism allowing DNA to be rewritten, spontaneously, sufficiently to create “radical changes in the cell’s genome” that transform a species into a new one. Transcending both genetics and epigenetics, meta-genetics concludes that the origin and evolution of species are driven neither by coding DNA nor by regulatory proteins in cell membranes. Rather, meta-genetics establishes that these two basically similar phenomena are controlled, via potential DNA, by what might be called a life-wave. The life-wave is best understood as a potentially infinite series of waves, much as an ocean is composed of an endless number of waves while remaining a single body of water. The ocean in our analogy is the “torsion,” hyperdimensional sound domain of time-space, where individual waves act as sonic carrier waves for the genetic blueprints of past, present and future species (Figure 2). Biologist Rupert Sheldrake’s Morphic Resonance theory refers to this ener-genetic aspect of time-space as “morphic fields.” Dr. Sheldrake’s notion of “formative causation” stresses that these fields unite entire species universally outside space-time. Sheldrake goes so far as to theorize that these nonlocal frequency fields can be expressed biologically if correctly “tuned into,” even if a species is extinct. In order for a particular life-wave in time-space to “go live” and become an actual, physical species here in space-time, there is a specific meta-genetic protocol (Figure 2). In biological organisms, potential DNA serves as the principal connection point between time-space and space-time. In other words, potential DNA, far from being inactive, constitutes the hyperdimensional interface between the sound and light domains. In my book Conscious Healing, I described this interface as occurring through what I termed the genetic sound-light translation mechanism. This phrase indicates the process by which chromosomes assemble themselves into different configurations designed to “translate” highly stable waves of sound into light (and vice versa). The existence of the genetic sound-light translation mechanism indicates that the flow of information, or conscious bioenergy, through DNA is a two-way street. Light becomes sound, and sound becomes light. Of course, if we accept Dewey Larson’s Reciprocal System of physical theory and the existence of what I think of as sound (time-space) and light (space-time) domains, this must be the case. In addition, the conception of the human body as a hologram, the basis of quantum bioholography, depends on such a mechanism, which has been validated empirically. For an excellent overview of this paradigm-changing theory and the research supporting it, I recommend Iona Miller and Richard Alan Miller’s article “From Helix to Hologram,” which was republished in my popular free ezine DNA Monthly. Here in space-time, potential DNA appears as an inactive (noncoding) molecule, or part of a molecule. In this capacity, we can say that potential DNA is light-based, lacking any obviously transformational potential. In time-space, however, potential DNA appears as a sound wave in continuous dialogue with the greater life-wave of the consciousness field (Figure 2). The particle-wave duality—in which, say, an electron can be both a particle and a wave simultaneously—is an accepted phenomenon in quantum physics. Importantly, this duality can operate on much larger scales than the subatomic. Named after Buckminster Fuller, the Fullerene molecule, or “buckyball,” comprises sixty carbon atoms arranged spherically somewhat like a soccer ball. When propelled through a small enough “net,” buckyballs have been demonstrated to transform into waves and back into particles again. Of special interest to our discussion is that a Fullerene is roughly the size of a DNA molecule. Thus not only does DNA’s network of chromosomes translate sound waves into light waves, and vice versa. Figure 2: Sound, Light & DNA Activation. This illustration illuminates the ener-genetic interplay between the individual, DNA and the realms of space-time and time-space in personal healing and evolutionary transformation.It is also reasonable to assume that potential DNA exists with “a foot in two worlds,” exhibiting a molecular form in space-time and functioning as a wave in time-space (Figure 2). Potential DNA’s ongoing dialogue with the consciousness field allows for a constant, simultaneous exchange of information, in the form of sound and light waves, between time-space and space-time while bypassing any so-called tight restrictions on the flow of genetic information (Figure 1). In one direction, as an example, light-based (holographic) traumas occurring in space-time are recorded as time-space distortions in our sonic bioenergy fields—which are, in effect, nested life-waves within the greater life-wave. This example allows us to appreciate how, in a manner that challenges our notions of causality based on a perception of time as linear, potential DNA both is projected by the consciousness field and simultaneously projects its bioenergy blueprint in the latter. Here, in order to sketch the basic outline of the meta-genetic model “through the looking-glass” from the vantage of time-space, I have chosen to focus on the way potential DNA appears to emerge from the consciousness field. In a moment, we will explore just how human language can be used to correct sonic distortions, or disharmonies, in the bioenergy blueprint—allowing for information to flow from time-space back through potential DNA into space-time in order to actualize healing (Figure 2). In the meta-genetic model, potential DNA is both a form and function of the life-wave. In both cases, potential DNA can be theorized to exist as a consciousness blueprint in time-space before its physical manifestation in space-time. As the primary connection point between time-space and space-time, potential DNA’s dialogue with the sound domain is directly responsible for producing the consciousness blueprint that gives rise to a specific species. The previous statement summarizes the basic mechanism behind the origin of species. As shown in Figure 2, as this new nonlocal blueprint filters through potential DNA into local space-time, potential DNA becomes responsible for reorganizing the three percent of coding DNA into a novel configuration. Coding DNA, in turn, instructs RNA to build specific proteins and, ultimately, organisms. Significantly, a parallel phenomenon occurs during healing—only on a smaller scale. With the correct equipment, such as the quantum biocomputers used in wave-genetics, it is possible to observe at times subtle, but no less crucial, changes in potential DNA as the latter becomes activated “meta-genetically” during healing and transformation. In both instances, transposons, or “jumping DNA,” are instructed by potential DNA to shift their chromosomal positions—in small numbers when it comes to healing, but by the thousands during evolutionary transformation. In the case of meta-genetic healing, while the observable molecular shift cannot be said to transmute one’s basic DNA, nevertheless some genes necessarily are activated permanently even as others are switched off. Regarding evolutionary transformation, such a massive molecular rearrangement fundamentally alters genes and creates radically new protein-coding sequences that produce distinct and unprecedented creatures. The end result is the spontaneous evolution—which happens neither gradually nor adaptively, but as a veritable metamorphosis within a single lifetime—of an existing species into a new one. As Wilcock points out, this process—which can, and does, happen in regular, predictable cycles—explains why no “transitional” fossils can be found for so many species. Individually and collectively, there is only conscious evolution—or none at all. And such conscious evolution, personally and universally, occurs by way of DNA activation (Figure 2). In addition to illuminating how evolution works, meta-genetic theory also explains why DNA appears to contain so little information distinguishing one species from another. The life-wave in time-space, our real Brain, holds the consciousness blueprints for all species—which only manifest in DNA as, and to the extent, they are required for evolution. Finally, the science of meta-genetics offers a sound intellectual scaffolding supporting the widespread belief that humanity as a whole may be on the verge of a genuinely spontaneous evolution. Dr. Hawks is referencing measurable changes in DNA so exponential in the modern era that a human from 3,000 B.C. is more genetically comparable to a caveman than to someone strolling down the street today. Likewise, the Flynn Effect shows dramatic increases in human IQ over recent years that, having to do with abstract or symbolic thinking, simply cannot be explained by better education or improved technology. Fortunately, research and documentation that substantiate meta-genetics are available in abundance thanks to the pioneering work of Russian biophysicist Peter Gariaev, the father of wave-genetics. Recently, a team of linguists headed by Dr. Gariaev, while studying a cutting-edge branch of semiotics known as genetic linguistics, discovered that the genetic code in potential DNA follows uniform grammar and usage rules virtually identical to those of human language. This groundbreaking research grew out of Jeffrey Delrow’s stunning discovery in 1990 that the four nucleotide bases of DNA inherently form fractal structures closely related to human speech patterns. On the flip side, this theory supposes that human language is “genetic” in nature and can be employed to interface with the genetic apparatus like a key fitting in a keyhole. Gariaev’s hypothesis that DNA is language-based (and vice versa) is bolstered by Gregg Braden’s discovery, as described in The God Code, that the ancient four-letter Hebrew name for God is actually code for DNA based on the latter’s chemical composition of nitrogen, oxygen, hydrogen, and carbon. This assertion, with its enormous implications relative to DNA’s universal role as a divine language spoken through the body, has been peer-reviewed and accepted by numerous scholars of Hebrew. The research cited in this article establishes that the many human languages could not have appeared randomly, as is commonly taught, but reflect our essentially similar “genetically linguistic,” or “linguistically genetic,” blueprint. From a meta-genetic perspective, it is worth noting, emergence is an excellent term to characterize how biological species spontaneously evolve. Furthermore, genetic linguistics reveals that DNA not only assembles proteins through RNA transcription, but also stores and communicates data in a patently linguistic fashion. In fact, Gariaev’s team found that the genetic code in potential DNA follows, for practical purposes, the same foundational rules as human languages. In a moment, we will explore how this new way of understanding DNA as an intrinsically linguistic phenomenon helped give birth to the many practical applications of wave-genetics. But before doing so, let us look briefly at another revolutionary discovery. The theory of wave-genetics holds that potential DNA regulates meta-genetic, self-organization functions that occur in a hyperdimensional realm, which I have called time-space following Dewey Larson. According to wave-genetics, potential DNA magnetizes nonlocal streams of information from time-space to its physical location in space-time, then forwards this information to our consciousness—including our “genetic consciousness” that manifests biologically. Grazyna Fosar and Franz Bludorf, authors of an excellent summary of Gariaev’s findings, Vernetzte Intelligenz (“Networked Intelligence”) (summarized in English by Bärbel Mohr), refer to this data transfer process as hypercommunication, often experienced as intuition or inspiration. When hypercommunication occurs, according to Fosar and Bludorf as reported by Mohr, an extraordinary phenomenon is observable in DNA. Gariaev irradiated a DNA sample with a laser until a typical light-wave pattern formed on his computer monitor. When the DNA sample was extracted, the pattern was still there, unaltered. Numerous controlled experiments proved that the pattern emanated from the absent sample, whose bioenergy field remained undisturbed for a whole month—even after being sprayed with liquid nitrogen—causing light to spiral on its own, as it were, tracing the outline of the physically removed double helix. This meta-genetic phenomenon has become famous in new science circles as the DNA Phantom Effect. It appears that torsion waves from time-space continue to flow into space-time—where they manifest electromagnetically—for a month even after the DNA is removed. The research Wilcock references involved experiments by Dr. Ignacio Ochoa Pacheco in which DNA emerged in a hermetically sealed container—containing only distilled water and sand heated to the point of killing any living organisms therein—when exposed to consciousness, or torsion waves. an international panel from the Russian Academy of Sciences, the Max Planck institute in Germany and the University of Sydney found that galactic dust could form spontaneously into … double helixes […] and that [these] inorganic creations had memory and … power to reproduce themselves […] The particles are held together by electromagnetic forces that the scientists say could contain a code comparable to the genetic information held in organic matter. Meta-genetics provides a theoretical basis for understanding how biological life originates from so-called nonliving material. From numerous pieces of hard evidence I barely have touched on, it appears that universal creative consciousness quite literally speaks the physical world, including DNA, into being. Meta-genetics simply and logically explains why all human DNA is fundamentally linguistic in nature and why language can be understood and utilized from a genetic perspective: the very energy that created DNA is language-based. The idea that “in the beginning was the Word” is central to the vast majority of the world’s most venerable religions and mythologies. Although it is just now coming into its own, this idea is also the key to the evolution of the biological sciences into their mature, Era III expression. Beyond any reasonable doubt, based on redundant scientific data, behind the DNA molecule exists a template of linguistically-sourced consciousness that directs the formation of organisms at the level of DNA. By modifying this bioenergy blueprint meta-genetically through linguistic means, we can alter organic expression, facilitating both healing and transformation. One truly mind-blowing implication of Gariaev’s research is that to activate DNA and stimulate cellular healing as well as conscious evolution, we simply can use our species’ supreme expression of creative consciousness: words. This is possible because, as pointed out, the electrical energy involved in producing human speech automatically creates torsion waves of sound and light capable—when properly articulated—of accessing, resetting and transforming our bioenergy blueprint in time-space. Employing pure linguistic frequencies embedded in radio waves and laser technology, Gariaev proved that chromosomes mutated by X-rays can be repaired; that a diseased pancreas in rats and missing adult teeth in humans can be regrown; and even more amazingly, that the genome itself can be rewritten. Using sound and light waves keyed to human language frequencies to rescript DNA, as opposed to gene splicing, Gariaev’s team transformed frog embryos into perfectly healthy salamander embryos in the laboratory. Moreover, this was accomplished noninvasively by properly applying vibration and light, or sound combined with thought, or words, to DNA. Gariaev’s historic experiment in embryogenesis highlights the immense scope of meta-genetics—an area which has an obviously more primary impact on the origin and evolution of species than genetics or epigenetics. If you’re a visionary or change agent, these are exciting times! The Internet has leveled the playing field for those who want to make a difference in the world. A passionate tribe leader can create the same visibility that just a short while ago was possible only for corporate giants with the help of organized mega-media. Everyone, and anyone, can share their message and “be the change.” Evolutionary vision is no longer limited to a small circle or secret club. Today, the same words that are in the daily lexicon of conscious entrepreneurs are uttered in the halls of corporate America and delivered internationally in keynote speeches. If you’re looking for things to change in your world, there’s no better time to start than right now and no better place to start than you. Nothing out there shifts, until you do. And change begins with you. Today, there is no reason to walk around clueless and bemoan the circumstances and conditions of your life. You can awaken to the power that is your birthright and bring change to every aspect of your world. • Sensations of heaviness, sluggishness or tightness in the body. Discomfort and a lack of ease in your body, mind and spirit are clear signs that you are positioned at the portal of possibility. This may show up as resistance to a task, an uncomfortable exchange with someone, feeling “less than” or uncertain about something. No matter what it is, if something has your full-on attention, it’s yours to explore. 1. Partner with Life. If you truly want to be a conscious change agent, then the first thing to do is open up to the power source that creates life, and consequently has the rocket fuel to propel your every movement. Whether you call it God, Source, Life or Love, it is the dynamic, enlivening power that gives rise to everything, everywhere. 3. Engage the Living Essence in ALL things. NOTHING is inanimate—everything has life, energy, and possibility. Nothing is static! All is in exquisite and dynamic flow and movement. See the brilliance in others. Bring it into play in ALL your relationships, projects, and adventures. View your “story” as up for interpretation. Explore what aspect of “your story” is up for review and revision. Life is pulsating with aliveness and now IS the new. Everything can be realigned to its brilliance! 4. Take Responsibility for Your Point of View. You are the creator of your experience. Shift the “less than” perspective by choosing to explore a new point of view. There is a new paradigm for creating change in the world today, and it is accessible to you this very minute. You don’t have to do things the old way—with lots of effort, pain, and drudgery. All you have to do is partner with it now. 5. Explore an Empowering Perspective. As you tune into your point of view, and unhook from the surface level of reality, you’re going to notice that there are multiple perspectives. To be the change requires shifts in thinking and being. Different choices then arise that lead to new actions. Invite curiosity into the sandbox, even as you feel the discomfort of an uncharted landscape. Choice is an act of personal power. It grows with use! 6. Engage the Power of Passionate Possibility. Tell the truth. How often do you bemoan the problem instead of engaging the possibility? Is it any wonder that as much as you say you want a different world, the same one keeps showing up on your doorstep? If you want to shift what IS, you need to feed what wants to BE, right now. Possibility is the playground of your vision. It’s where your actions sculpt your vision into being. Being the change is woven into your DNA. You are an evolutionary being, from a long line of visionaries. Tap into your innate design to be the change. Reality is flexible. It is woven by visionaries (just like you) activating infinite possibility into the warp and woof of cosmic creation. Love powers vision, vision fuels action, action realigns reality. Be the change! The world clamors for your Essence. Copyright © 2011 by Adela Rubio. All Rights Reserved. The purpose of this book is to release one particular secret, which has been kept hidden for the last 12,000 years. The Philosophers’ Stone, Elixir of Life, Fountain of Youth, Ambrosia, Soma, Amrita, Nectar of Immortality. These are different names for the same thing. The Stone’s history and the history of the human race up until this day are a strange story full of secret societies, hooded cloaks, and mystical symbols. Such theatrics are childish and shallow. It’s pointless to look for the light in the shadows. The Philosophers’ Stone is real; you can make it at home. The Stone makes old people young, heals all forms of sickness and disease, extends your life, turns any metal into gold, and more, as you will learn. This isn ’t a myth or a metaphor; it’s a fact. Don ’t judge this book before you’ve read it. This is not one of those airy fairy books written in all kinds of mystical language, filling pages with words that make sentences but not sense. This book will make more sense than anything you’ve ever read before. The age of secrets is over. I’m writing this book in common English. There’s no need for mystical language or metaphor. This book contains no hidden meaning or codes; everything is stated plainly and directly, in the shortest and simplest of words necessary to convey the meaning. Alchemy is the art of imitating and accelerating Nature. It is a natural art and science. In alchemy we do not really make anything; all we do is provide a condition for Nature to do what Nature does. So the Philosophers’ Stone is not really made by the alchemist, it is made by Nature. The alchemist only provides the conditions so that Nature can operate effectively and without being disturbed. An alchemist then only makes the Stone in the same way that you make a tree by planting the seed and leaving it for a few years. Once the seed is set, if the conditions are right then it just grows by itself, in accordance with Nature. If you are wondering how this leads to the Philosophers’ Stone, I will explain it more clearly. The Philosophers’ Stone is a natural occurrence of Nature; in fact, it is the aim of Nature. Therefore, if you can find a substance which is very pure and infused with life-energy, then put it under protected conditions which are advantageous for its natural development, you will allow Nature to take its course in an accelerated manner. When this is complete, Nature will have made for you the Philosophers’ Stone. It's very simple and entirely natural, which is the biggest part of the secret. I will explain again in another way: the Philosophers’ Stone is the name of the thing that you get when Nature has finished doing what it does all day long. The Earth and the entire universe are going through this process. If, however, you find a substance already quite well matured by Nature, clean it up, then put it into a closed system, or microcosm, Nature will finish this thing long before it finishes everything else. So you get the result of Nature earlier and can enjoy all its wonderful properties while the rest of the world is still [struggling]. I think most of us already have a feeling that there is some kind of life-energy we obtain from our food, drink and air. We all know that eating fruit is better than taking vitamins; we know that there is something in the juice of the fruit. We know that raw vegetables are better than cooked vegetables. We know that cooking food destroys the “goodness” in it. We eat other life forms, and we know that the more alive or fresh our food is the better it is for us. There is also much to be said for breathing deeply and rhythmically and not just for the oxygen, else we would get the same effect by breathing air with more oxygen, but that’s not necessarily the case. This life-energy is physical in the sense that it can be captured and made use of. You could say that this life-energy is the smallest particle, of which all other particles are made. Or you could say that everything is made of energy, and this is that energy in a raw and undetermined form (not yet formed into an element), which is probably closer to the truth. The foregoing text is public domain. Please feel free to share as you see fit. As a full-time researcher and writer on the nature of reality and consciousness (and other “fringe” topics), why am I grateful for this brilliant piece of cutting-edge work, Potentiate Your DNA? 1. As I put it in my above question: it’s brilliant and cutting-edge. 2. It’s just flat-out fascinating. 3. 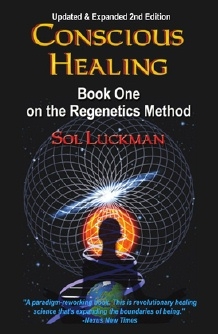 Luckman has succinctly and elegantly provided a comprehensible intellectual framework for understanding the profound role of DNA in healing and transformation. 5. Potentiate Your DNA elucidates the incredible profundity of sound in the context of healing—and why it’s more potent and fundamental than light. 6. Potentiate Your DNA takes us well beyond both Era I allopathic/mechanistic medicine and even Era II “mind-body” medicine. The Regenetics Method takes us into the transpersonal domain of Era III medicine, beyond the limitations of our conscious minds to “re-program” the energy blueprints that encode our physical bodies. 7. Luckman presents us with the doorway into time-space: DNA. He also gives us the key to open the door: Solfeggio frequencies (sound) and Potentiation. I have been intrigued by the notion of sound for healing, but Potentiate Your DNA put me over the edge. I am tired of the “treatment and maintenance” approach to my own maladies (including lingering joint injuries and food allergies, to name two)—even if that approach has allowed me to avoid having to interact with the corporate-controlled medical system and its endless torrent of mostly useless (and dangerous) prescriptions, while learning much about health and nutrition. But now, I want solutions. I believe this book may have given me the tools to achieve that—I don’t see any other way forward now but to utilize sound and reach beyond symptom management to an out-and-out transformation. After all, it worked for Sol—and he had been in a horrendous state of ill-health for years—all catalyzed by yellow fever and hepatitis vaccines which, as he explains, most likely caused damage enough to his DNA to begin his downward spiral and years-long search for a method of healing that transcended symptom management and improved upon “merely” curing. One of my hobbies is vaccine research, so I know that Luckman is not clutching at straws or making wild or unfounded claims about vaccines. Long story. Ultimately, we have those fateful jabs to thank for the remarkable personal journey to wholeness Luckman brings us—and the birth of the Regenetics Method. For this I am grateful—and I think you will be too.